For me, writing is a solitary, focused pursuit. Although I love music in other circumstances, when I’m writing, I need absolute silence. I have, on occasion, written with others present, but I do my best work when alone. I find I need complete concentration to fully immerse myself in the story and characters. Once I tended to type the first draft, but these days I prefer to write them by hand, and I do that in my library/music room. I have a wonderful, comfy chair there, and all books and musical instruments around me. It’s a place in the house that is just for me. The room gets plenty of natural light, and it’s somewhere I feel completely relaxed and can tune out everything except my writing. From there, I move into my study, where I type up all I’ve written. I do this every chapter or two, so it’s not a huge task at the end. Once that’s done, it’s time to print. I prefer to edit my own works on paper, so it’s back to the library! Now I move between the two rooms, doing three or four rounds of redrafts and edits. Then it’s time for the final on-screen proofreading. Location is a huge part of my writing process. If I don’t feel comfortable and completely at ease, the words don’t flow. I’m not someone who can just take a pad and pen with me and write anywhere, so sadly no arty corner spots in cafés for me. But I love my library/music room. Therefore, doing all my writing there is no great hardship. 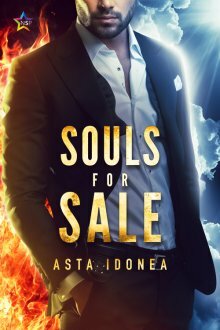 When demon Saul persuades comic book artist Tom to sign over his soul in exchange for a night of passion, little does he know what lies in store. Demons can’t fall in love—or so he’s been told—but he finds himself smitten and attempts to destroy the contract, desperate to save Tom from an eternity of torture. With Saul and Tom forced to run, a showdown between Heaven and Hell ensues as the angels and demons argue over who owns Tom’s soul. But does either party have a stronger claim than Saul?